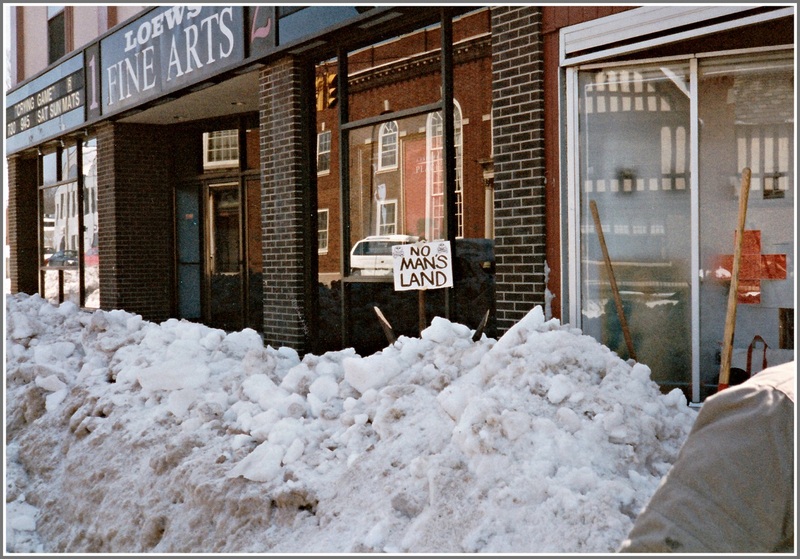 This entry was posted in Downtown, Friday Flashback and tagged Fine Arts Theaters, Max's Art Supplies. Bookmark the permalink. Oh, how I miss the Fine Arts theatres. And Onion Alley where we used to go for a hamburger between shows on a “double header” day at the Fine Arts. I remember that season well. My daughter-third child-was born in April and much snow fell late. I couldn’t open the garage door in March because of the snow piled against it and the streets were pretty messy. When you’re counting down to baby day timing really is of the essence. But everything went well and the snow did melt. That’s a lot of snow but it’s plowed snow. The illusion is that it’s plowed right up against the store and the theatre, which would be rare. There’s still a sidewalk there. I don’t remember that snow-date in particular, maybe just one of many snows. But I did miss the Fine Arts and Max’s. It was March(12&13)…’Storm of the Century’ (as billed by some media) – storm started in Gulf of Mexico, then crossed Florida, and intensified to a deep nor’easter as it moved north along the coast…it came into Connecticut on a Friday night – CL&P called us all into work, with me staying there in our Norwalk work center until 11 pm Friday, then back into work at 6 am Saturday – it was very windy with 10 to 12 inches of heavy wet snow in southern CT, but very few power outages in lower Fairfield County. The town and state highway crews did very good plowing of roads and most schools closed early on Friday so very few were impacted by this storm, which ended up affecting the southeast more severely than the Westport area. Wow, I have a pretty good recollection of that spring-ish storm, if memory serves correctly … I was working at Mickey Herbst’s Quick Copy, along the famed “Fine Arts/Max’s, Ships” stretch at the time. It sure felt like a whopper, and I do believe the State of CT did an official shut-down because of it.